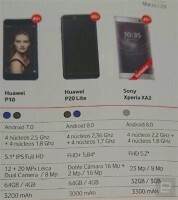 While the Huawei P20 family was not at the MWC in Spain, the Huawei P20 Lite did show up in a brochure from Vodafone Spain. 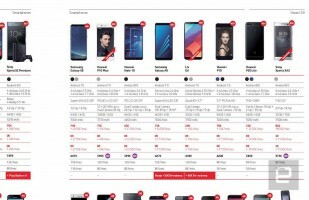 The carrier helpfully listed the salient specs, pretty much confirming what we already know from leaks (with some differences, rumors tend to round numbers off). The P20 Lite will have a 5.84” screen with 1080p+ resolution. The phone is pictured from the back, so we can’t see how much of the screen the notch takes up. Good thing that there are leaked photos. We do see the dual camera on the rear with its 16MP + 2MP sensors (given its resolution, the secondary camera will be used for bokeh). The selfie camera is a single 16MP shooter. The phone will launch with Android 8.0 Oreo and EMUI 8.0 running on a Kirin 659 chipset (it’s not named in the brochure, but the clock speeds match). It comes with 4GB of RAM and 64GB storage, matching the Huawei P10 listed beside it. The battery has 3,000mAh capacity. The Huawei P20 Lite will be unveiled on March 27. In Spain, it will cost €370 SIM-free, but Vodafone will sell it to you for €14.50 a month. It will be available in Black and Blue. The Nokia 7 plus is far more attractive than this at that price.